We made the decision to move from our own home into a granny flat during the Christmas school holidays. And at the time, I went into a frenzy of a spring clean, selling things, donating things, and throwing things out. It was a great opportunity to cleanse our home and belongings and get rid of unneeded clutter. Although I hate to get rid of anything, I was able to part with many of my treasures. 3 kids later, I am realising that if I keep storing their belongings and mine I will soon become a candidate for that show, Hoarders. We aren't this bad. Yet. Madeleine, however, was a bigger problem. She was 12, going into high school, and still didn't want to get rid of any stuffed toys, littlest pet shops, pretty pink little room decoration, saddle club posters, etc etc. This on top of her growing liking for One Direction, nail polish, and other more teenagerish activities. So her room was overflowing with crap, and pretty much impossible for her to keep tidy. 1. Things that she could not do without during our short stay in the granny flat (which turned out to be 3 months, not quite as short as I expected). School things, dance things, and the most used entertainment items (iPod, nailpolish, DS). She was given an underbed storage box and if she couldn't fit it into that, it couldn't come. 3. Things that she didn't want to get rid of, but that she could do without for a while, so it could go into longer term storage if necessary. I wasn't entirely sure how big our new house would be, and there was always the potential that I would leave lots of things in storage for a while. It turns out our new home is plenty big, actually bigger than our old home, so everything is gradually getting unpacked. After 1 term in high school, without many of these belongings, Maddy is suddenly realising she doesn't WANT alot of it. Many things won't be making their way back into her room, and she is happy to pass them down to Lorelei or get rid of them altogether. She doesn't want the toys of her childhood, because she realises she won't play with them. She doesn't want all her baby stuff toys, because they don't fit with the new, older, room she has been creating for herself in this new home. I'm glad I didn't make her get rid of things, because I think she would have felt the loss more sharply and been upset at their absence. By doing it this way, we have still culled her belongings, but it has come about naturally. It's definitely a lesson I will take on board as the 2 babies grow up, that maybe I can just put away things that they have outgrown, and give them the chance to get some separation gently. 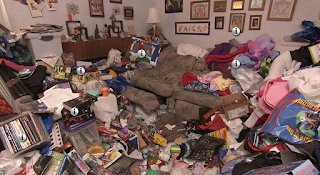 Are you a hoarder, or are you able to make the cut ruthlessly when needed? That is a great lesson, I am glad that she made the decision on her own. I cleaned all my sisters baby toys up at around the same age, but she kept getting them back from the garage because it was too much change at once. Love this idea. Was in my eldest girls room today, and it is always a mess. Doesn't matter what I do, it's just crazy in there, because she likes to keep too much stuff. Maybe I'll just put things away for a while as well.